The viral post comes with a "rant, an awareness and a call for help" (See below), explaining the circumstances of Emylou's working conditions. Although a novice, Emylou apparently has been assigned to a multi-grade classroom and is expected to submit more than 20 lesson plans everyday. And with all the burden, Emily has no one to receive support from, no counselor, no schoolhead or supervisor who maybe able to guide, assist or simply listen. Teachers are also human beings who have needs and limits. THIS IS A RANT, AN AWARENESS AND A CALL FOR HELP POST! This morning we lost a good friend. Cause of death? Depression. She took her own life thinking it was the easiest way out of all the gazillion paperworks a public teacher must all require to goddamn pass. 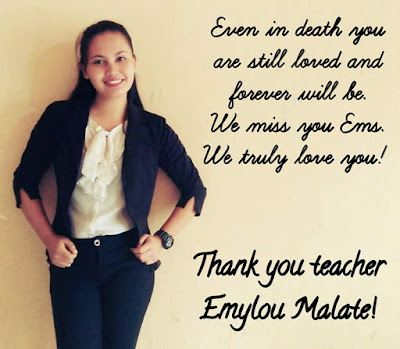 Yes, our dear Emylou was a newly hired public teacher. Four years at college, almost a year preparing for the board exam and waiting for its result, plus another half a year of waiting for a very unsure item even tho u have a lesser chance because the system requires whom u know, and not what u know. And our Emylou, she was lucky. Or was she? Our dear friend was just a neophyte in the field, and pretty sure ecstatic to start her new class, idealistic as a new teacher should be. Because after all, this is the ultimate end goal of our almost 4 year and plus in college right? But why Emylou? Why have you gave up so soon? Why haven't you tried opening to us when you were that friend na would always remind us na "Ayaw pagprinoblema hitun malalagas kala. Kitaa daw ako matawatawa la. (Stop sulking over ur problems, you'll grow more gray hairs. Look at me, i never put my smile down)"
We're left with a myriads of question that we wished u would answer right now, because Emylou, WE.ARE.STILL.IN.SHOCK. We knew you as an Amazon. We knew you were stronger than most of us. You never gave up way back in college. You were a believer, let alone a faithful one. You didnt cut. You were one of our classmates we looked up to because u were secretly good. Note: Major factor of her death ay yung work niya as newly hired PUBLIC TEACHER. 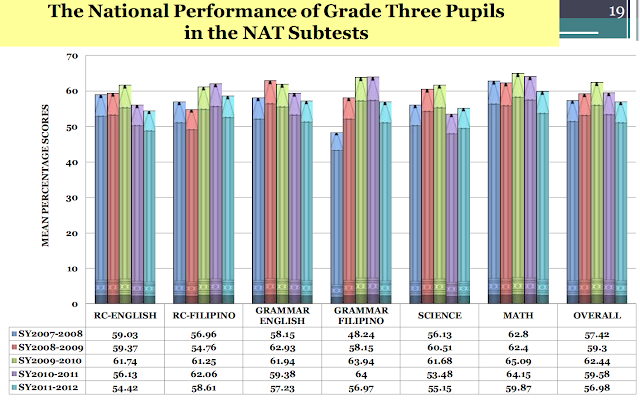 To DepEd Philippines, WHEN WILL YOU GET OVER THE FACT THAT THE MAIN REASON FOR THE SO-CALLED NOBLEST PROFESSION OF ALL, WHICH APPARENTLY IS TEACHING, NA OUR MAIN AND ONLY GOAL IS TO EDUCATE CHILDREN. I REPEAT EDUCATE THEIR YOUNG MINDS! Not those futile endless paperworks na would just end up in the trashbins after being checked. Tapos mag aask pa kayo ng papers ngayon and kailangan submitted na bukas? What are we? Breeze commercial? May lakas ng sampung kamay? I know there's a slim to none chance that u'll be able to read this, but please. We also need help. To finance us, not with our pockets, but with our emotional and physical state. Kahit stress debriefing lang or kahit anong paraan just to prevent this horrible incident. Ilang buhay pa kailangan ibuhis for someone to take action this problem. PREVENTION is better than CURE, right? Eh kahit guidance counselor walang nakaassign in most of the schools especially in Elementary. Newly hired teachers shouldn't be bullied with paperworks and nonsense bullying because we're NEW. Like a child, we need someone to mentor us, to guide us. Not someone who'll drag us underneath the ground when we're already down. Not someone who is very inconsiderate to mock and sometimes make fun of us. Not someone who'll bombard us with 20+ lessons plans a day (bec a multigrade class was assigned to her with 3 classes, imagine? 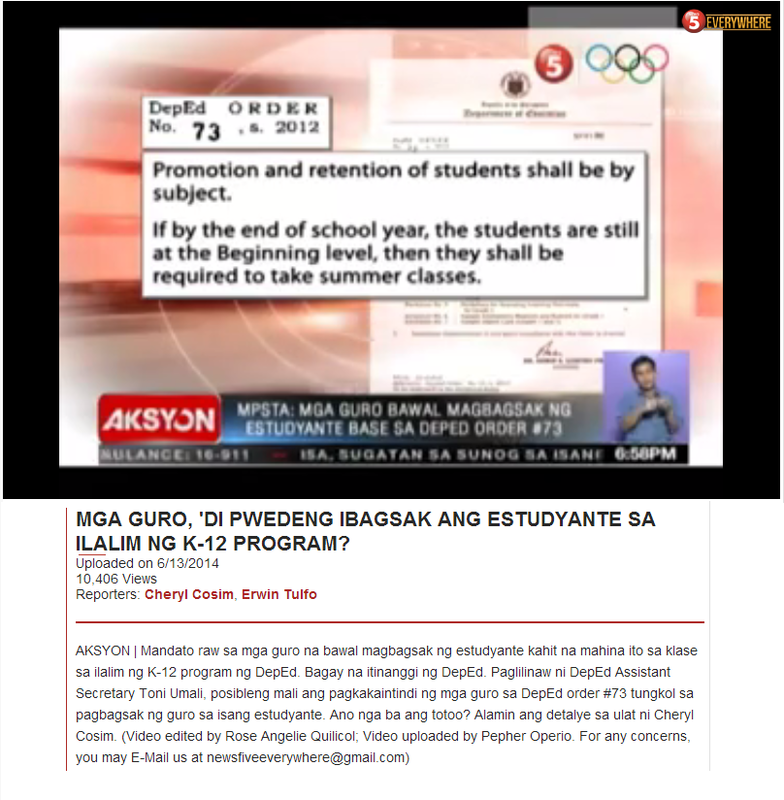 Again, she's just NEOPHYTE Wala siyang ENOUGH na training nito, bakit kailangan yung bagong teacher ang dapat ilaban sa giyera na to?) worst when we already have a 50 plus or more papers to be checking and recording from last day and 50 more from this day. We do not need all of these. We do not have to go thru all of this. Emylou shouldn't have gone thru this. We just need to deliver our lessons and make sure our children are all getting it right. After all, a lesson plan is just a guide right? Everything mustn't be followed. And how can u assign a newly hired teacher to a multigrade class? Aren't there a lot of applicants who excruciately waits for their item? I know, because i am one them. Why won't be smart enough to think na pwede kayong mag assign ng old at yung may teacher na may background na so that a multigrade class will not be a burden to him/her since alam na niya yung pamamalakad sa pagturo hindi yung bagong hired na teacher na wala pang alam. Lastly, please appoint school heads that aren't a headache to their constituents. We already had enough of toxic co-teachers who's hobby is to bully new teachers, dadagdagan nyo po ng heads na very inconsiderate and insensitive. We already had enough of it. When are we going to move deped? When there are more lives taken? Or when there are no longer graduates applying for public service? BECAUSE CLEARLY THIS HAS TO STOP. 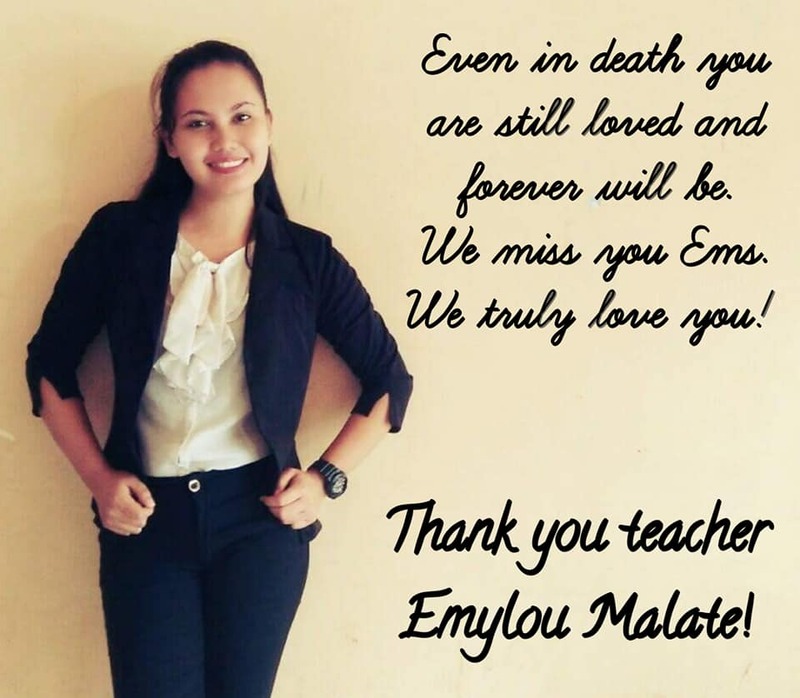 To Emylou, wherever you are right now, we know you're at peace. Guide us from above especially to those who mourn so much about your departure. We love you so much! You'll always be remembered.